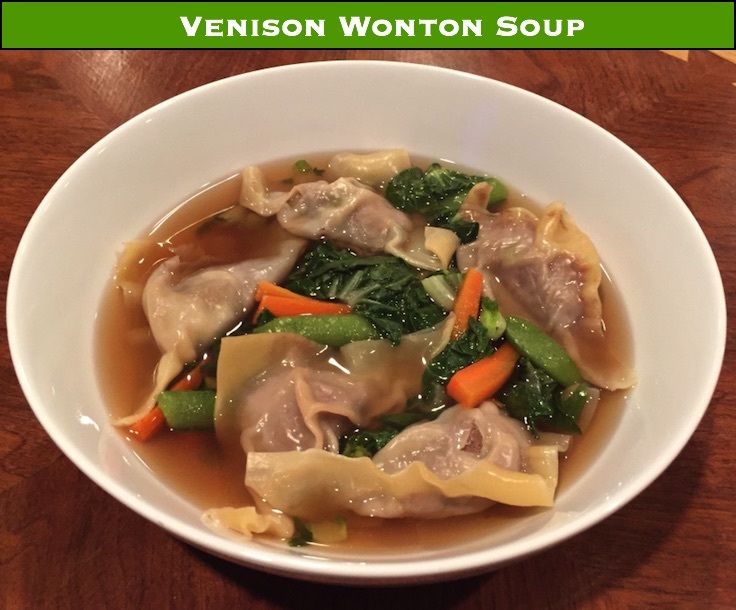 Wontons are fun and easy to make, and can be used in a variety of ways, from soup to some tasty fried appetizers. The good experience they had – usually jerky. The bad experience they had – some tough roast that they (or someone else) cooked too long and needed a chainsaw to cut. Well, one of my goals is to breakdown venison stereotypes. 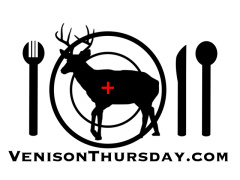 When it comes down to it, venison can be substituted in any recipe that calls for a four legged animal. Beef, lamb, and pork recipes plague cookbooks and internet recipe sites. And I can (almost) guarantee you, that if you have a good recipe, you can swap venison in and you can have a great venison meal. Learn your cuts of meat, and understand how they compare across animals, and not only will you become a better cook, but you’ll help to break other people’s venison stereotypes. If you are a hunter, that means listening to less whining about “eww, venison”, leading to more venison meals, leading to needing to hunt more next year to keep everyone happy. Which of course means you need a new bow. And maybe a new gun. 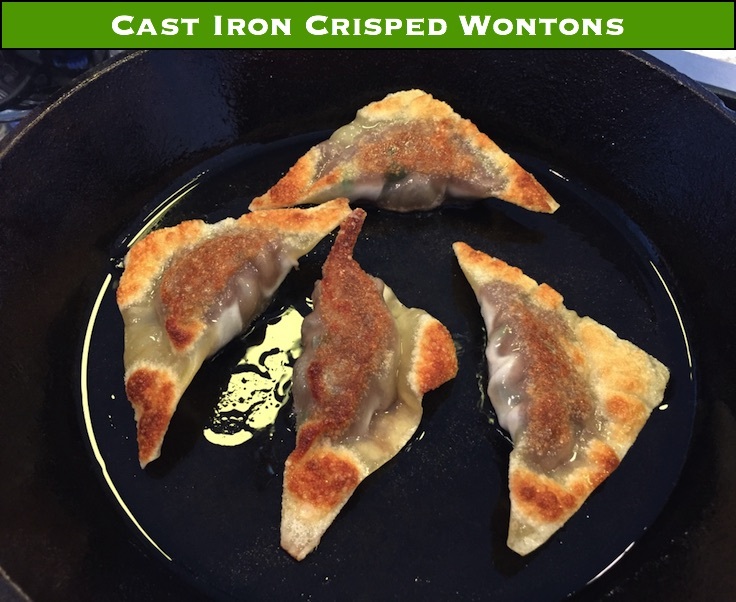 Make some wontons for soup, and make some for frying. Cast iron, like bacon, and butter, makes everything better. We’re using ground venison to make the wontons. While there is nothing fancy about ground meat, it’s still important to consider what you are grinding up. If you think about beef, you’ve probably seen things in the grocery store like ground chuck, ground round, ground sirloin, or just plain old ground beef. Chuck and round you may be familiar with if you’ve read other recipes here. Chuck means neck or shoulder, round means it’s coming from the rear quarter. Sirloin is some prime stuff, comparable to the end of a backstrap on a deer. And plain old “ground beef”? Well, in deer comparison, that’s just whatever scraps you had left over from anywhere as you were butchering. So, what does all this mean? In beef, it primarily means fat content, from highest to lowest: ground beef, ground chuck, ground round, ground sirloin. That pretty much is the reverse of the price, your ground sirloin will cost a lot more than ground trim pieces. But what about for deer? The difference in fat content is still there, but to a lesser degree. Deer are so lean, that it would be hard to argue the fat content difference between the loin and a well trimmed round roast. Where it DOES come into play is in those trim pieces you saved especially for grinding. Odds are, there will be some fat in there. And venison fat has a chalkiness to it, that most people don’t enjoy. That’s why you will read so much about trimming out the fat. However, when it comes to the trim meat there is a fine line between well trimmed and wasted. So my point here: if you are cooking something where the venison will stand out, you may want to grind a roast up instead of using your trim meat. You will have much better control of any fat, and you’ll end up with dish that will get NONE of those “eww, venison” complaints. Thoroughly whisk the cornstarch into the sake in a large bowl. Add the rest of the wonton ingredients and thoroughly mix. Refrigerate for an hour or so. 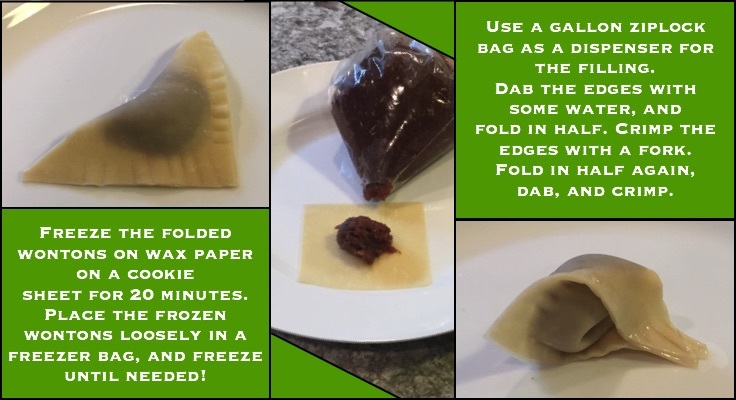 To stuff the wontons, take a wrapper, add a tablespoon of the venison mixture to the center, and brush around the outside of the square with water. Fold in half diagonally, sealing the edges. You can use a fork to squeeze the edges and to add a little texture as well. 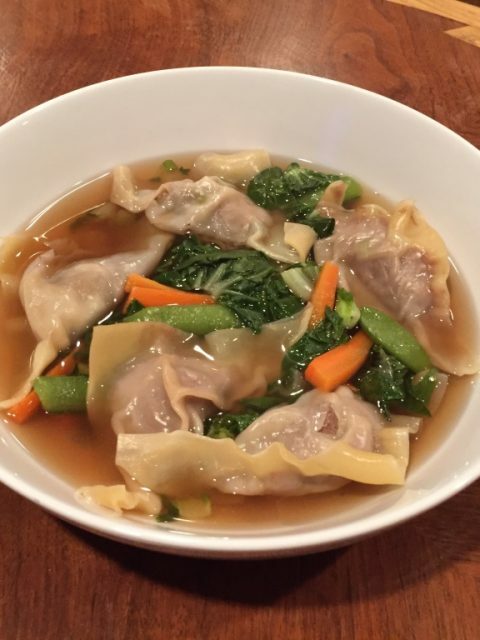 You can single fold or double fold your wontons. They taste the same either way! These suckers will stick to each other if left in contact for too long. If you are not going to use them right away place them on a lightly greased baking pan with space between them so they don’t touch. You can make these up ahead of time, and refrigerate until ready to use. Cook your soup vegetables: add the bok choy, peas, carrots, and green onion a steamer, and steam for a few minutes until tender. The bok choy cooks similar to spinach, so it will really compact down as it cooks. Bring the stock to a simmer in a saucepan. Add enough wontons to not overcrowd the pan, and poach them till the venison is no longer pink, between 5 to 10 minutes. You can do multiple batches if need be, depending on how many you want in the soup. 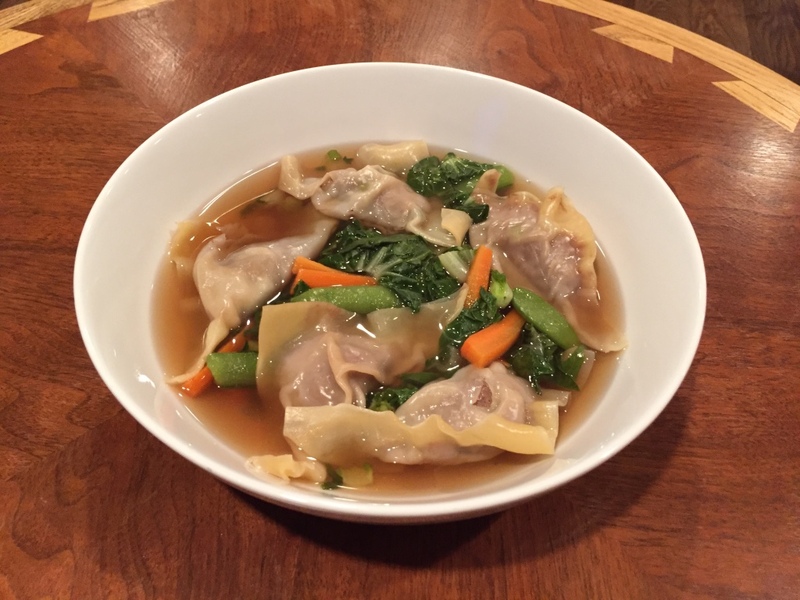 To serve, add some of the vegetables to a bowl, and add the wontons and broth on top. Save at least a few of the wontons (don’t poach them) and fry them. They crisp up nicely and make great appetizers. 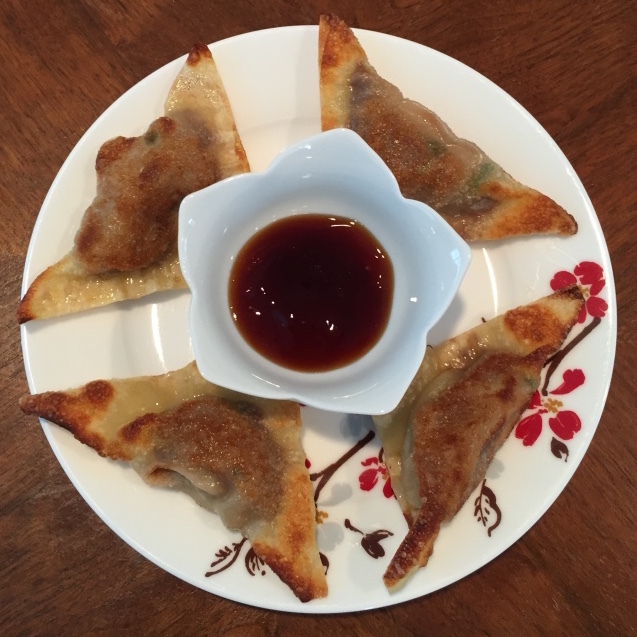 Add a little teriyaki sauce to your fried wontons and you have a perfect appetizer. Previous Previous post: Venison Chili – and don’t forget the Cornbread!